Huge 9-inch flowers in stunning all-our bloom from midsummer to fall. Full and fluffy, they load the foliage- a glorious display of color. Branches bow under the sheer weight of the blooms. Adaptable size for landscaping- grows 3-5 feet tall. Best planted in full to partial sun. Height: 3-6 feet Spacing: 4-10 feet Depth: Place in a hole 2 times as wide and deep as the pot; plant top of root ball at soil surface. 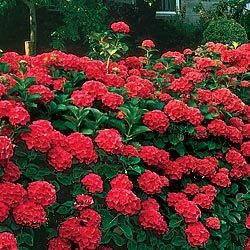 Sun/Shade: Light shade Color: Red Foliage: Loses leaves in the fall Blooms: Mid summer to early fall for 1.5-2 months Size at shipping: 6-12'' Ships bare root. Comments: Lime may be added to the soil to intensify color. Mulch deeply during the winter and protect as follows in Northern climates: Place a chicken wire cylinder around the plant, fill with straw, shredded leaves, or other non-compacting material. For extra protection, wrap in burlap. Fertilize in the spring with a 5-10-5 fertilizer. Prune only immediately after flowering as flower buds form on old wood. Foliage may be toxic to some degree if ingested.